Beautiful Bentley upright piano finished in a rich walnut. The piano has been designed in the ever so popular Art Deco style and whilst in need of some restoration work it will form a lovely project for someone with moderate skills. Beautiful Bentley upright piano finished in a rich walnut. 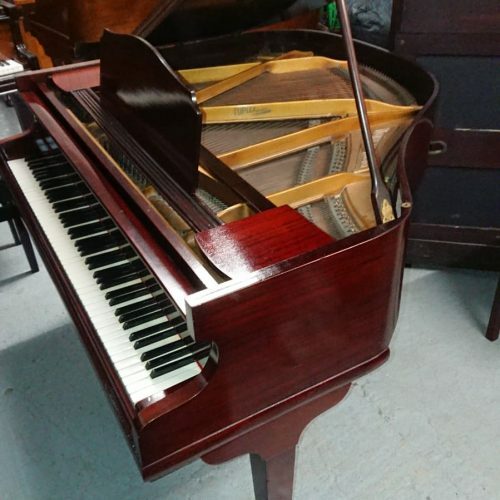 The piano has been designed in the ever so popular Art Deco style and whilst in need of some restoration work it will form a lovely project for someone with moderate skills. 2 pedals, 85 keys and 7 octaves, the piano is overstrung and under damped and produces a rich and mellow tone. Dimensions: height 109cm, width 135cm and depth 54cm. Price includes FREE delivery throughout the North West, FREE first tune and a 12 months warranty for complete peace of mind.